The younger sisters of Maureen Dares sit with her in a Halifax hotel room, hoping for a call to say she has a place go before their money runs out. 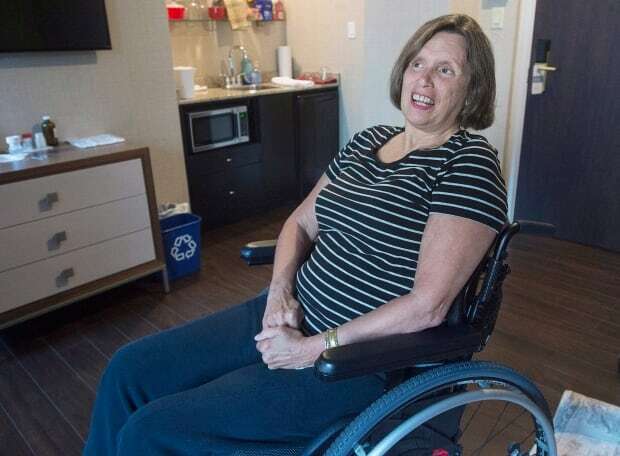 The 58-year-old woman with multiple sclerosis and epilepsy is among about 912 people in this part of Nova Scotia awaiting a nursing home spot. “Quite honestly, I find it scary. I find it terrifying,” she said as she sat near a table with her medicines neatly arranged in a row. Like other Canadians who move relatives from home care into the queue for subsidized care, sisters Janet and Sandra Glazebrook are discovering the steep financial and emotional costs involved. After the death of her husband, Dares’ brother-in-law moved in to care for her. However, he had to move out earlier this year for health reasons. That, along with the discovery of mould in the home, set off an unforeseen family crisis. The sisters searched unsuccessfully for a new caregiver to supplement the daytime home care the province provides, and then started paying the price for private care. Janet, a 52-year-old hotel accountant, and Sandra, a 55-year-old nurse, say within months $ 40,000 of their savings were gone for the provision of private home care, which they estimate at $ 440 per day. 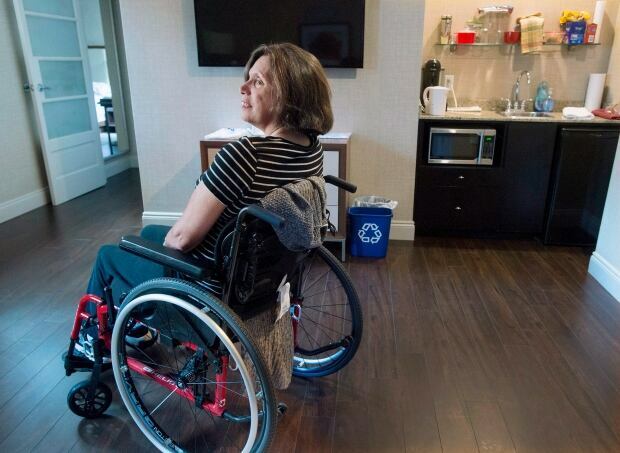 “The care cost was astronomical. It ran through our money pretty quick,” said Janet, sitting across from her sister, who worked at a radio station and raised two daughters before the illnesses led to the disabilities she lives with now. Dares was moved from one nursing home to another for almost a month under a respite care program, making her anxious and uncertain. “I don’t have a home anymore. I’m on the move,” Dares said. Meanwhile, Janet and Sandra say their own homes can’t accommodate the wheelchair access Maureen requires, nor can they provide the attention she needs. That puts the family into the queue, which in the central zone of the Nova Scotia Health Authority is currently an estimated wait of six months. “For us it is an emergency situation. We don’t know what to do with her … or how to support the care she needs,” said Janet, who arranged the Lord Nelson room that is her temporary home. To save cash, the sisters and Sandra’s husband Gary Siepierski take turns sleeping in the room, ready to help if Dares has a seizure. “What do people do who can’t afford the care while they’re still waiting to get into a nursing home?” asks Janet, holding her hands in the air. It’s a question that’s also being asked by advocacy groups fighting for reduced waiting times when a transition to long-term care is necessary. Peter Howarth, a retired school administrator in Brampton, Ont., said when he researched care for his wife Maureen after her stroke, he rapidly realized annual home care costs of about $ 150,000 a year were far beyond what he could afford. “The idea of aging at home is a smoke screen,” said the volunteer for CARP, formerly known as the Canadian Association of Retired Persons. The Nova Scotia provincial health authority’s central zone — which includes Halifax — currently has 912 people on the waiting list for long-term care, with about half of those located in a facility while awaiting a transfer to a care home they’d prefer. Since 2015, if a person refuses a placement within 100 kilometres, they’re taken off the wait list and only allowed to reapply three months later. John Gillis, a spokesperson for the authority, said the agency can’t comment on individual cases like Dares’. Meanwhile, the issue is similar throughout the country. For example, Ontario’s Long Term Care Association says the latest figures for the past summer had 32,000 Ontarians on wait lists for long-term care. 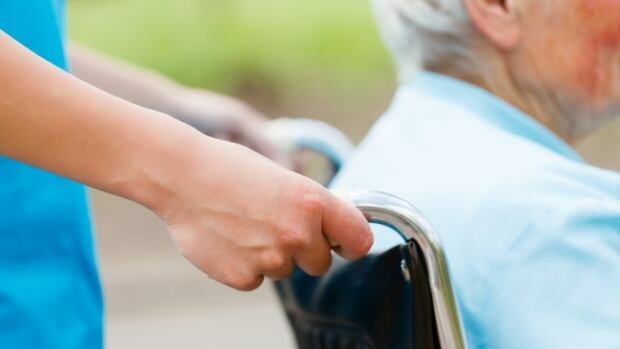 The association warned in a summer pre-budget submission that the need for nursing homes will likely mount, noting census data shows that for the first time since 1871 Canadians over the age of 65 are outnumbering those under 15. Nova Scotia’s Health Department has budgeted $ 569 million for long-term care, and $ 263 million for home supports. After public criticism of budget cuts made in the prior year, the Liberals increased spending on home care by $ 5.1 million and added $ 3.2 million to increase food budgets and recreation programs for residents in long-term care facilities. However, it hasn’t been released yet. Elizabeth Smith-McCrossin, health critic for the provincial Progressive Conservative Party, said the Dares’ case may be solved as media and opposition party attention is drawn to her situation. But she says its a symptom of a system struggling to find the ailing, aged and infirm safe places to stay more quickly. “She’s in an unfortunate situation and I know there are other families experiencing similar things around the province,” she said.